William Tyndale, The newe Testament of oure Sauiour Iesus Christe: Faythfully translated oute of the Greke. With the notes and expositions of the darke places therein (London: Rycharde Jugge, 1553); CCL, H/N-3-3. Author: Dr Stuart Palmer; Lecturer in Early Modern History, University of East Anglia. In this season of Advent, evocations of the nativity and the Christmas story start to swirl around us all. 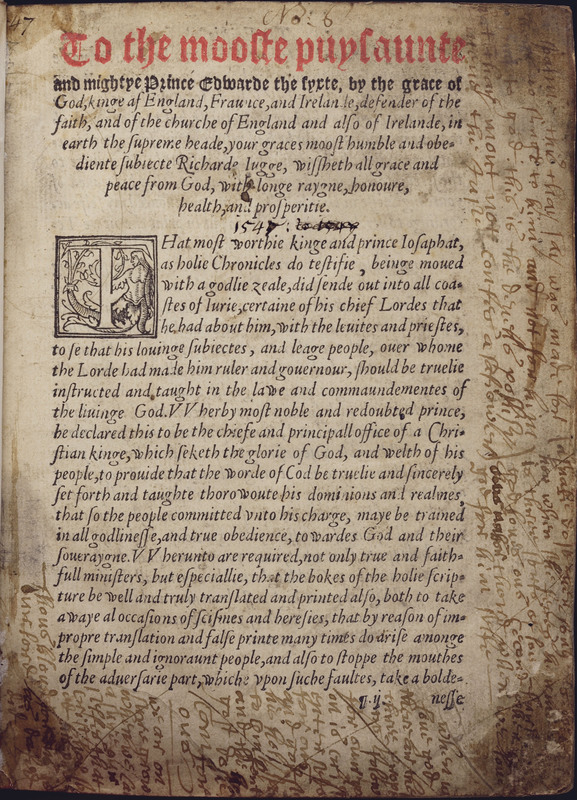 This month’s image is taken from a wonderfully rich 1553 edition of William Tyndale’s translation of the New Testament, printed and sold in London ‘at the signe of the Byble’ in the final months of the reign of King Edward VI. Tyndale’s was the first English Bible to be translated alongside systematic use of the Hebrew and Greek texts, and as such in the minds of Protestant readers represented a ‘purer’ version of the Word than those derived solely from Jerome’s Vulgate. In light of this belief, editions of Tyndale’s New Testament were printed frequently both in England and on the continent, often being sold in attractive yet functional editions such as this one. While it is a handsome quarto size and contains numerous images, the accommodating margins and abundant notes, headings, titles and paragraph markers betray that this is a book to navigate and ponder, either in a home or, more likely, in a parish church. Our image depicts the Annunciation to the shepherds and their subsequent Adoration as described in the second chapter of the Gospel of Luke. While undeniably crude, elements of contemporary Northern European artistic styles abound in the small scene. The gently rolling hills upon which the shepherds recline are dotted with Vitruvian ruins, while the portrayal of the shepherds is reminiscent of the many peasants which feature in Netherlandish genre paintings. Like many early modern woodcuts designed to accompany printed text, this image describes a narrative of events as opposed to a single instance. In the background, an angel delivers the ‘tydinges of greate ioye’ (Luke 2:10) to an oversized shepherd flanked by his flock. To the left, the shepherds resolve to ‘goo eve vnto Bethleem’ (Luke 2:15), and in the immediate foreground the two shepherds bow and worship before the Holy Family. The recently born Christ Child lays un-swaddled ‘in a manger’ (Luke 2:16) flanked by barnyard animals in a rendering that remains as ubiquitous to modern eyes as it would have been to early modern ones. This multi-layering allowed the image to form an active part of the interpretive process that accompanied the reading or hearing of the text, allowing the literate and illiterate alike to better visualise and remember the biblical scene. In this sense, these woodcuts operated in a similar way to the wall paintings and pageant displays that typified late-medieval devotion. Early modern English translations like this one are littered with interpretive aids such as these; in this edition we find upwards of 50 woodcuts in the Gospels and a further 20 in Revelations, that most dramatic of books. The context in which this edition was printed is also key. Given how toxic Tyndale’s name had been two decades prior to its appearance, it is testament to the ever-shifting sands of Tudor religious policy that his once-notorious translation of the New Testament should appear in quarto with an address to the King. 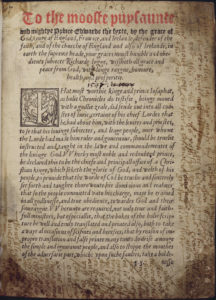 Edward’s accession was marked by a reinvigoration of attempts to instil evangelical reform in England, and after a royal injunction in 1547 every parish church in England was compelled to purchase a vernacular Bible. Following this, around 40 editions of various English translations of the Bible or New Testament were issued during the remainder of Edward’s reign. The printer and editor of the text, Richard Jugge, reproduces the ‘copye of the bill assigned by the kinges honorable counsell, for the Auctorisinge of this Testament’, dated to June 1552. In the year that followed Jugge issued three separate editions of Tyndale’s work, further attesting to its lingering popularity and the lucrative nature of the bible trade. During the 1520s, Tyndale’s failed attempts to have his translation printed in England and his later success in getting it printed in Antwerp and smuggled into England were the principle cause of his eventual arrest and execution for heresy in Belgium in 1536. Despite this, Tyndale’s translation lived on through numerous editions not to mention separate translations for which it formed the basis. 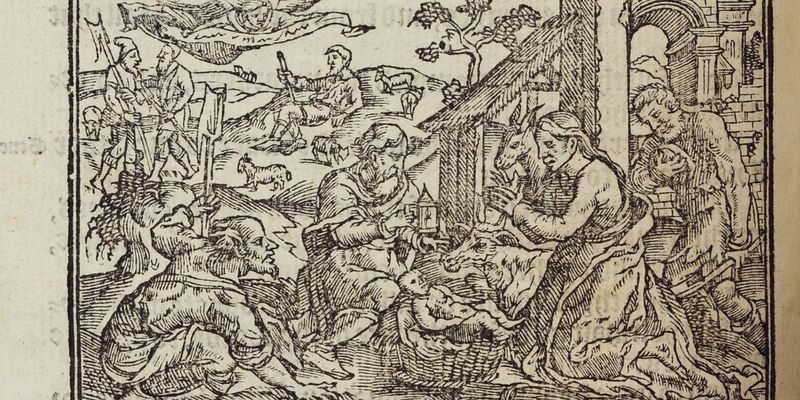 Images such as that of the nativity which we see here provide us with a familiar glimpse into our own understanding of this season, but also give an insight into the various forms through which early modern readers encountered the Christmas story. Henry Wansbrough, ‘Tyndale’, in The Bible in the Renaissance: Essays on Biblical Commentary and Translation in the Fifteenth and Sixteenth Centuries (Aldershot: Ashgate, 2001), pp. 116–32. All biblical quotes are taken from Tyndale’s translation of the New Testament which is freely available online.